I am a New Adult Horror/Psychological Thriller Writer, Blogger, Webmaster, and a Personal Caregiver. Also, I'm a former Radio Show DJ/Hostess from UW-Parkside's 101.7 WIPZ. * In 2006, some of my poems and short stories were bound to my chapbook at Carthage College. * In 2012, I hand wrote 3-4 additional short stories. * In November 2013, I made Writers Cafe's front page under the category, "Writers To Watch." * On May 24, 2016, I had the wonderful opportunity to interview the former bassist of White Zombie, Sean Yseult. * On January 21, 2018, I launched my an experimental website on Blogger called, OMG, Anna! What's Going On?! Eventually, I will finish revising and expanding my short stories for submissions, in order to be published. As of 2018, my schedule has been hectic and chaotic both on and offline. Less blogs have been published during 2018, in order to spend more time revising short stories for author submissions. After publishing OMG, Anna?! What's Going On?! on January 21, 2018, I went to bed that morning. By the afternoon, I woke up and suddenly, it dawned on me. I realized "OMG, Anna! What's Going On?!" sounds MUCH catchier than It's Not All Gumdrops & Unicorns! 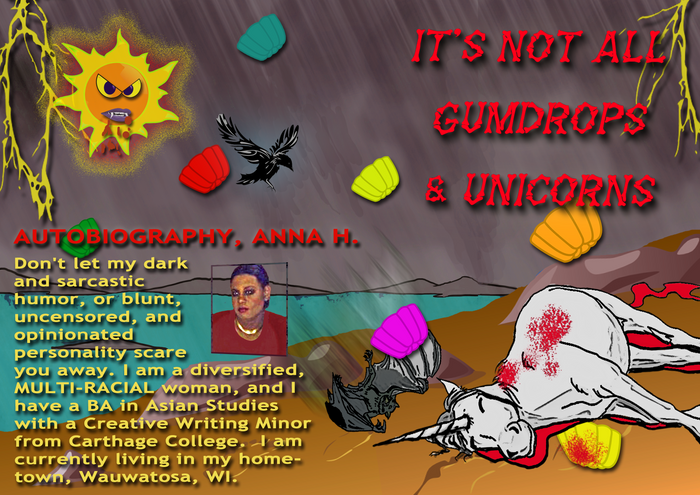 You are probably shocked and filled with questions such as "Anna, you built It's Not All Gumdrops & Unicorns, 5 years ago. Why the sudden change?" Blogs, that are normally published on this site consist of Song Saturday (as BLOGSTER TRADITION), Cartoon Sunday, and blogs featuring other topics. Therefore, please feel free to read, listen, and watch my Song Saturday and Cartoon Sunday blogs, as well as blogs featuring other topics. **** If you're already a gumdrop (member), you have access to the "Horror/Thriller" page. Normally, I put my blood, sweat, tears, and pride into my websites and the content I share on OMG, Anna! What's Going On?! and It's Not All Gumdrops & Unicorns. There are also more than several past blogs on It's Not All Gumdrops & Unicorns from Horror-Punks.net, Xanga, Blogster, and WritersCafe.org. Most have been archived on JournalHome.com. Blogger is my alternate site. What is"It's Not All Gumdrops & Unicorns"? Originally, It's Not All Gumdrops & Unicorns was "It's Not All Bunnies And Sunshine." It's Not All Bunnies And Sunshine was a rushed version of my chapbook. This was in order to meet the deadline and graduation requirements for the Creative Writing Minor. At that same time, I was battling a severe health scare. Let's just say that I out bled the hallway from The Shining and Bleach's Ichigo Kurosaki combined. It caused me to rush and compile as many of my poems and short stories as possible, in 2006. Since I was displeased with some of my older work and because it has been 13 years, I have decided to remove and revise some of it, while expanding on newer content. I'm removing my old poems, keeping my previous short stories, and will continue adding new content for my future collection of short stories. Want to learn more about me? There are additional blog links for you to click on. Anyway, take a tour around It's Not All Gumdrops & Unicorns and stay tuned!